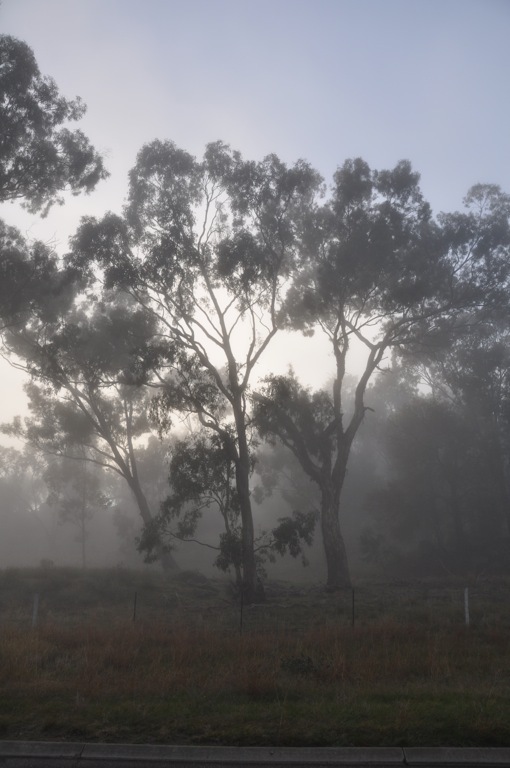 This is what mornings look like in Wagga Wagga winter winter. This week, it hasn’t been getting as warm during the day (only around 12, instead of the 15 or so earlier in the month) and the mornings have been crisp and cool. Some might even say cold. Three days in a row, Dan has had do scrape frost of the windshield of the car. Just the front…by the time he has been leaving at about 7:40, the sun has melted the rest of it. But, you ask, why are you scraping ice from the car? Don’t you have a garage? We didn’t get rid of all our winter items when we moved – we did ditch the big ice scraper but the little one from Eddie Bauer has come in handy for this thick layer of frost. 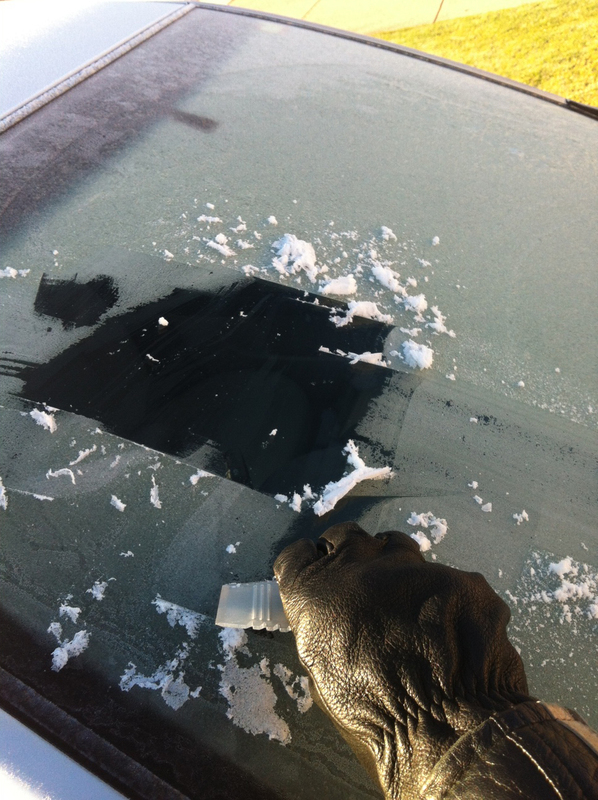 And of course, we do need gloves some mornings. Well, yes, we do, but we are also car-sitting for friends who spend part of the year in Wagga and part in Canmore, Alberta, and their car is in the garage right now. And the other half of the garage is taken up with bicycles, lawnmower, general post-move disarray. So the car we use daily sits in the driveway. And gets frosty at night. Inside, it is usually warm and toasty though. Lisa has been away a lot, and Dan doesn’t even leave the heat on most nights. He thinks that we probably used more electricity in the 48 hours that Lisa was home last weekend than in the entire previous week. But last night, after awaking the previous morning to a 10 degree house, he did leave the heat on. He turned off some zones, so only part of the house was heating, so he wouldn’t get too hot. Because here’s the weird thing about our heater: remember a few posts ago when we were discussing the bad wiring of the thermostat. Well, turns out it isn’t really a thermostat. It is officially called a ‘remote’. Lester likes to hang out in the bathrooms and watch us shower in the morning. 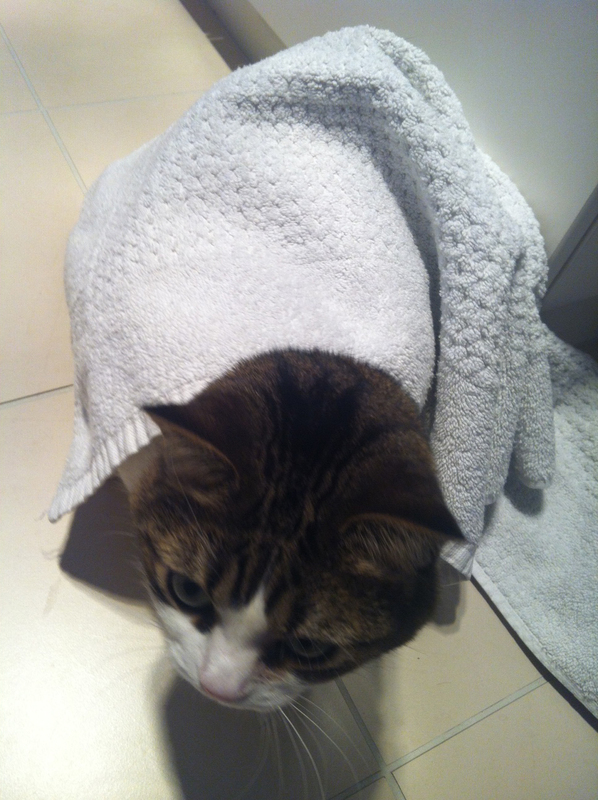 But for some reason, Australians don’t heat the bathrooms, so this morning he took the bath mat from in front of the shower stall and ‘rugged up’. It is wired remote, fixed to the wall, but it is just a controller. It isn’t the actual thermostat, so unlike what we are used to in other (as in ‘normal’) places, when we set a temperature on that unit it isn’t actually at that unit that the temperature is getting measured. The temperature sensor is on the actual heating unit, which is in the ceiling above the garage! So we set the temperature for 18 degrees and the heat goes on, and stays on until the empty space above the garage gets that warm. Which, since we moved in, is never. Inside of house gets up in the low 20s…and would get hotter if we didn’t turn it off, using the ‘remote’. Which would make more sense if it was actually a remote that you could carry from room to room, rather than one fixed to a wall. We’ve said it before, and we’ll say it again: Australians just don’t understand heating. And at least the worst it gets is just a little below 0 a few times each year…we don’t miss Edmonton’s -40 winters. And while this reverse cycle heating and cooling unit might have its quirks, this summer we will be glad it isn’t a swamp cooler like in the rental house. This entry was posted in cold, heater, house, seasons, wagga, winter. Bookmark the permalink.